Interview with Dr. Robert Cialdini, author of "Influence: The Psychology of Persuasion"
Often when making a decision about something we don't use all the available relevant information. There is too much of it and we frequently don't have the ability to decide what information we can trust. So we rely on others. In order to get our creative ideas accepted by our company or any other organization, or to have innovative products accepted by the marketplace, we need to persuade others to take action. We need influence. Vern Burkhardt (VB): What is your definition of influence? Dr. Cialdini: To me, influence means change. That change can be in an attitude, a perception, or a behavior. But in all instances, we can't lay claim to influence until we can demonstrate that we've changed someone. Dr. Cialdini: We all have the potential to be influential, although some of us make more use of it than others. VB: Can we get it? Dr. Cialdini: Definitely. The ability to influence is not simply inborn. We can learn to become dramatically more successful at it. Recently, I've recognized that for centuries, the ability to be influential and persuasive has been thought of as an art. And that's true. But there's also a science to it. And if it's scientific, it means it can be taught. It can be learned. We all have the potential to become more influential. VB: Are there any ethical concerns surrounding the use of influence to get people to say yes? Dr. Cialdini: That's a good question. Because the principles of influence can be so powerful in causing change in others, we have to consider our ethical responsibilities in the process. Fortunately, the way to be ethical in the use of these principles is the same way to be profitable in using them. Always be sure to influence another in a way that ensures you haven't damaged your ability to influence this person again in the future. In other words, the other person must benefit from the change you've created. VB: How, specifically, do we do that? Dr. Cialdini: We do it by harnessing one or another of the six universal principles of influence. First is reciprocation. People give back to you the kind of treatment they have received from you. Second is scarcity. People will try to seize the opportunities you offer them that are rare or dwindling in availability. Third is authority. People will be most persuaded by you when they see you as having knowledge and credibility on the topic. Fourth is commitment. People will feel a need to comply with your request if it is consistent with what they have publicly committed themselves to in your presence. Fifth is liking/friendship. People prefer to say "yes" to your request to the degree to which they know and like you – no surprise there. And sixth is consensus. People will be likely to say "yes" to your request if you give them evidence that other people just like them have been saying yes to it. VB: How have you seen these principles used? Dr. Cialdini: Although there are six optimal approaches to influence not everyone uses them well. In fact, in my research, I was able to detect three kinds of influence practitioners. There are bunglers of influence, there are smugglers of influence, and then there are sleuths – detectives – of influence. Bunglers are the people who fumble away their chances to use the principles in a beneficial way, either because they don't know what the principles are, or because they don't know how to engage them properly. These people are always dropping the ball when it comes to the influence process. Smugglers, on the other hand, do know, quite well, what the principles are and how they work. But they import these principles into situations where they don't naturally exist. An example would be a salesperson who pretends to be an authority on a particular computer system in order to get a customer to buy it. Although the smuggler's approach often works in the short run, it's deadly in the long run, because only one person – the smuggler – wins. The customer who gets fooled into buying the wrong system will be unhappy with it, and will be unlikely to ever return to that salesperson or dealer for future business. Finally, there are the sleuths of influence, who are more knowledgeable than bunglers, more ethical than smugglers, and overall, more successful than either. They approach each influence opportunity as a detective, looking to uncover and use only those principles that are truly part of the situation, and that, therefore, will steer people correctly toward when to say yes. So, for instance, if our computer salesperson genuinely is an expert on a particular system that a customer is interested in, it would be foolish not to share this information with the customer right at the outset. And if the salesperson has been good enough as a detective to find out that that particular system has a unique feature that no other system has, he or she would be a bungler not to say so, and make use of this scarcity principle which is a natural part of the situation. It's not sufficient to know what the most powerful principles of influence are. We have to train ourselves to search every influence situation for the principles that reside there naturally, and to use only those principles. That way, we assure an exchange in which both parties profit. VB: What's the most important thing when making a request? Dr. Cialdini: Oddly enough, often the most important thing when making a request is not in the request itself. It's in what you do before you make the request. This is a little secret that's understood very well by the most accomplished influence professionals, the people I call "the influence masters." I've found that those who are most successful at getting what they ask for work very hard at first arranging a favorable psychological environment for their request. After all, even if you've got a perfectly wonderful idea to offer, many people won't bother listening to it unless you've first done something to make them like you, see you as an authority on the topic, or feel a commitment to your idea. By first establishing an environment of liking, authority, commitment, obligation, scarcity, or consensus, you give your request the benefit of falling on fertile, rather than stony, ground. VB: Would you give an example of how to apply one of these principles of influence in a way that is effective, ethical and enduring. Dr. Cialdini: Let's take the first principle I listed, reciprocation. The one which states that people want to give back to you the kind of treatment they've received from you. For a manager, this rule is a goldmine. We all know the value of having positive attitudes and personal relationships in the workplace. Now think of the advantages to a manager of understanding the rule of reciprocation in the achievement of those goals. Because people give back what they've received, it means that you can increase the level of whatever you want from your co-workers and employees by giving it first. If you want more information, provide them with information. If you want to create a feeling of trust, you offer it first. If you want to foster a cooperative attitude, you show it first. By acting first, you get to set the tone for the type of workplace relationships you want. Now, let's take information sharing as an example. It's undeniably true that in any business, a manager will be able to plan, execute and complete tasks more successfully to the degree that he or she has access to the necessary information. By providing others with the amount, level, and quality of information that they want, the manager will get the amount, level, and quality of desired information in return. And it will flow naturally. No need for any arm-twisting or surveillance – because, as the research clearly shows, disclosure is a reciprocal thing. And, of course, when the necessary information is being sent and received in an office, everybody wins. Particularly the manager who's job success benefits as a result. VB: What is the difference between influence and manipulation? Dr. Cialdini: When most people say, "Oh, you're manipulating me," they mean something negative. They mean you're taking them in a direction that is not in their best interests. That's different than education. Though education is a form of manipulation, if you think about it. You're manipulating someone's knowledge of a situation or their understanding about something. And that seems to be fine. So we want to think of it as educating people about what is properly inherent in a situation that leads them to a right choice, versus saying something that is really deceptive and dishonest. I call deception and dishonesty the unfortunate side of manipulation. VB: What is your definition of ethical influence? Dr. Cialdini: Well, I think the ethical approach to influence is to be like a detective – the sleuth's approach. It's to find one or two of the six principles in a given situation, and raise them to the surface. Find something people can value, give it to them, and they will want to give you something of value in return. They will want to return that business. If they see you've done a good job, they will want to have a relationship with you, a continuing relationship. If you see genuine scarcity, something you can offer that nobody else can provide, something unique or a unique benefit, offer it. Identify what you can offer that your competitors can't. It may not be one single thing. It may be a bundle of opportunities, benefits, or services – especially superior customer service. Once you identify what you can provide make a commitment to do so. Tell them what it is they can't get anywhere else. If you can identify the unique benefit you can provide, they'll want it because it'll be beneficial to them. VB: How can we best do that? Dr. Cialdini: Always look for those things that already exist in the situation. Put on your Sherlock Holmes hat and become a detective. Find one of the six principles in the situation. Are you an expert? If so, bring that to the surface. Tell people about it before you ask them to move in your direction. They don't have a crystal ball. They don't know you're an expert, that you have so much experience, so many diplomas or so many credentials. Or that you have the necessary background and training about how to do the job well. They can't know these things until you make them part of the situation. Remember what I said about the "masters" of the influence process? It's always what they do first, before they make the request. VB: The rule of reciprocation – of reciprocity – reflects the basic human feeling that we are obliged to repay in the future any favors, gifts, and invitations that we receive. You point out that sociologists have found no human society that does not subscribe to this rule. Does it follow that of the six principles reciprocation is the most likely to influence others to do what we wish? Dr. Cialdini: No, I wouldn't say that. I have a colleague who told me he'd spent the majority of his professional life, sixteen years, searching for the single best influence approach. He caught my arm at a conference a while ago and said, "Bob, I've found it. I've found the single best influence approach. It is not to have a single influence approach." I agree with him completely. There are six universal principles of influence. Optimal success requires understanding the specific features of each influence situation and which principle best applies to that situation. VB: What are some of the unanswered questions about influence, about persuasion, that still need to be studied by social psychologists or other disciplines? Dr. Cialdini: An especially interesting arena for further study for me concerns the question of how these principles of influence work in other cultures. Consider the results of a report published by Michael Morris, Joel Podolny, and Sheira Ariel, who studied employees of Citibank, a multinational corporation. The researchers selected four societies for examination – the U.S., China, Spain and Germany. They surveyed multiple Citibank branches within each country and measured employees' willingness to comply voluntarily with a request from a coworker for assistance with a task. Although multiple key factors could come into play, the main reason employees felt obligated to comply differed in the four nations. Each of these reasons incorporated a different fundamental principle of social influence. Employees in the U.S. took a reciprocation-based approach to the decision to comply. They asked the question, "What has this person done for me recently?" and felt obligated to volunteer if they owed the requester a favor. Chinese employees responded to authority, in the form of loyalty to those of high status within their small group. They asked, "Is this requester connected to someone in my unit, especially someone of high ranking?" If the answer was yes, they felt required to yield. Spanish Citibank personnel based the decision mostly on liking or friendship. They were willing to help on the basis of friendship norms that encourage faithfulness to one's friends, regardless of the friend's position or status. They asked, "Is this requester connected to my friends?" If the answer was yes, they were especially likely to want to comply. German employees were most compelled by consistency, offering assistance in order to be consistent with the existing rules of the organization. They decided whether to comply by asking, "According to official regulations and categories, am I supposed to assist this requester?" If the answer was yes, they felt a strong obligation to grant the request. In sum, although all human societies seem to play by the same set of influence rules, the priorities assigned to the various rules can differ across cultures. Persuasive appeals to audiences in distinct cultures need to take such differences into account. VB: Why might people who are involved in innovation and creativity need to know about the power of persuasion? Dr. Cialdini: Although the principles of persuasion may not be used to help individuals develop innovative products or creative ideas, they can be used to help convince relevant others of the genuine value of the products or ideas. All too often, the reason an inspiration never becomes commercially viable is not because of weaknesses in the idea itself but, rather, because of weaknesses in the way the idea is advanced up the chain of command or into the marketplace. That's where the power of persuasion can help the innovator and can make all the difference. VB: You have an online video in which you talk about the six principles underlying influence at work. Dr. Cialdini: Yes, I talk about aligning yourself with the power of these principles. Scrupulous and ethical businesses and their employees can use the six universal principles of influence to positive advantage. On the other hand, we need to be aware of the "weapons of automatic influence" so we are not exploited by those who know how to trigger them. Knowing and recognizing Cialdini's six universal principles of influence can help us guard against being "exploited by clever others, leaving us looking silly or worse." Ever wonder why salespeople present their expensive product to potential customers before showing them the inexpensive ones, or why automobile dealers suggest additional options after a new car price has been negotiated and then only one option at a time? Dr. Bob Cialdini is a W.P. Carey Distinguished Professor of Marketing and Regents' Professor of Psychology at Arizona State University. He has also been named Graduate College Distinguished Research Professor. 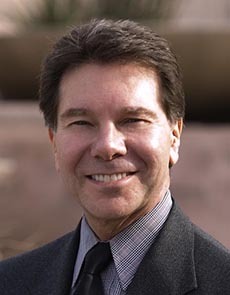 Dr. Cialdini is an internationally respected expert in the fields of persuasion, compliance, and negotiation. His books Influence: The Psychology of Persuasion, Influence: Science and Practice (5th Edition), and Yes: 50 Scientifically Proven Ways to Be Persuasive are the result of years of study into the reasons that people comply with requests in business and other settings. Dr. Cialdini received his Ph.D from the University of North Carolina and completed postdoctoral work at Columbia University. He has held Visiting Scholar appointments at Ohio State University, the University of California, the Annenberg School of Communications, and the Graduate School of Business of Stanford University.